The Black Line was an event that occurred in 1830 in Tasmania. After many years of conflict between British colonists and the Aborigines known as the Black War, Lieutenant-Governor George Arthur decided to remove all Aborigines from the settled areas in order to end the escalating raids upon settlers' huts. To accomplish this he called upon every able-bodied male colonist, convict or free, to form a human chain that then swept across the settled districts, moving south and east for several weeks in an attempt to corral the Aborigines. The incident shook the Aboriginal population so much that they were willing to accept the mediation of George Augustus Robinson and allow themselves to be removed to the Flinders Island settlement, where the population dwindled until repatriation to Tasmania in 1847 and the eventual death of the last full blooded Tasmanian, Truganini. A sculpture made of two strips of steel and aluminium subtly stretch out across the walls and floor of the museum. They are engraved with information about two historical events separated by more than 100 years. The first is an article that appeared in the London Evening Standard reporting on the “terrorism attack with acid” undertaken by radical Muslims against British students in Tanzania during the summer of 2013. Franco engraves the news onto the metal profile using hydrochloric acid, thereby transferring the emotions of the words onto the object which is itself made of the references it is making. For the second part of the work Franco describes an event that happened in Tasmania in the nineteenth century, during the so-called Black War, a conflict between the British colonialists and the Truganini aborigines. This event, known as The Black Line was a British strategy of forming a human chain to corral and ultimately expell the aborigines from the region. 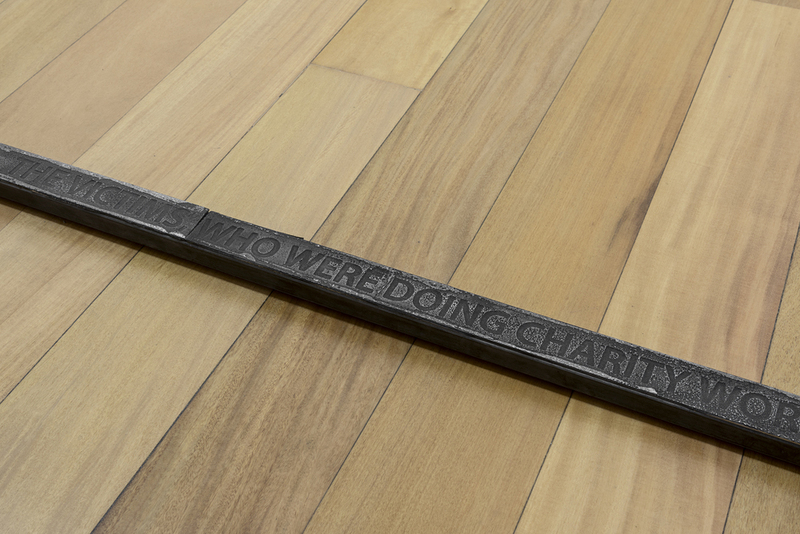 This text is presented in the exhibition as a 7 metre long black line. These two events are used by Franco as guidelines for a work that allows for the comparison in one field of representation of two historical moments that took place in two different places, thereby demonstrating how history tends to repeat itself time and again.